After parking in a big grassy field, we walk up toward the tents and music passing a couple of zombies en route - they look really really good! I become slightly hysterical. Next we sign a waiver and line up for race bibs and life belts. Each runner has 3 lives and they attach onto the belt with velcro. The bibs even have timing chips. Our team has not arrived yet so we go and sit in the bleachers in the sunshine to watch the final 'end arena' section. The course is marked off with red danger tape, a lot of it is twisty and this works well. Soon to be famous zombies? The rest of out team (Fast Food) arrives and we get a picture before we start. How many out of the 10 of us do you think will survive? We are at the start area at about 12:45 so we go early. The attendant has us doing jumping jacks first to limber up then we are off! Straight into this huge sonofabitchin hill. Our first zombie is at the bottom and we fly by in a cloud of dust and screams before grinding mostly to a halt. At the top we find awesomeness. I was not expecting water stations, this is brilliant. The next section is awful, there are tents and zombies right on the course and the buggars get 2 of my 3 lives! I don't have pictures as I am in an all out sprint-panic. The course levels off with a couple of rolling hills and more obstacles. 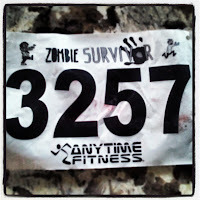 The next section is flat and winds around and there are LOTS of zombies. It is mayhem. We time our sprints through these sections with other clumps of runners and hope for the best. Some zombies are 'walkers' and some are 'hunters' and boy they are FAST. I have a theory that they are recently deceased athletes. We have a welcome break at the next obstacle. I am out of lives (already!) If you climb this thing they will give you another life but it is not going to happen. Since I am already infected I get the chance to take more pictures. I try to be a meat shield for Kev as he's still got 2 lives but he's in the game and not slowing down. My teammate has a run in with a super fast hunter zombie. She is literally jumping into the safe zone to elude him. I get an extra life from a 'kind' zombie on the course, Kev still has 2. Most of our team has 1 or 2 left but we have lost 4 team members somewhere! I think they left us for dead. 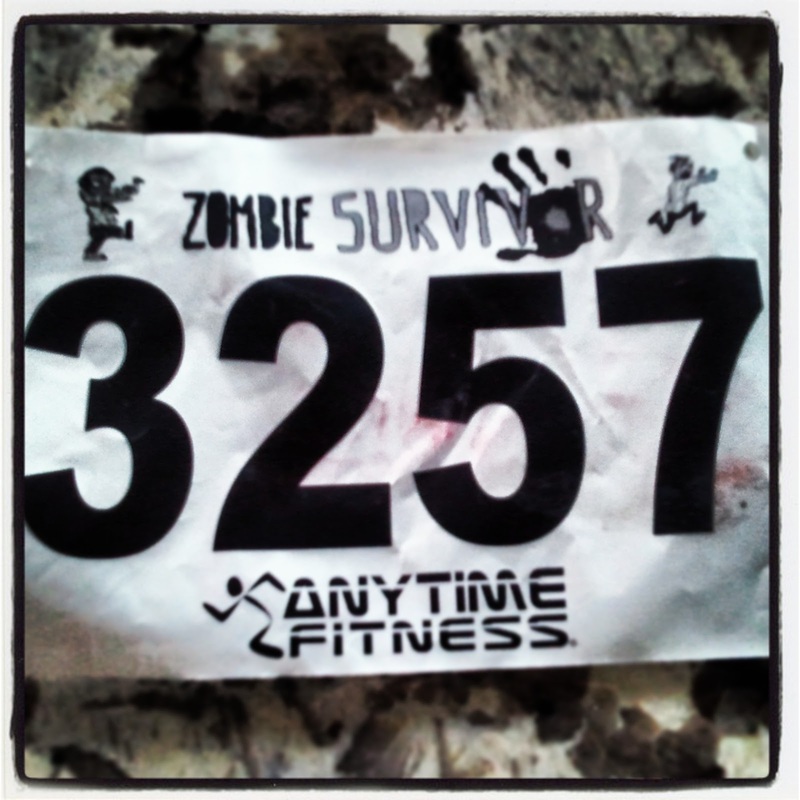 The course gets spectacularly crazy with a zombie infested pit of blood. My brilliant strategy of running merrily into the water then stopping after I am in it up to my lady parts and wailing works not at all and the big burly zombie takes my last life. It is carnage. The next part is downhill past LOTS more zombies and through a tent cunningly disguised as a safe zone but actually infested by zombies. We arrive at a barn with a dirt yard and everyone is given the task of moving a gas can from one end to the other by a truck, then entering the barn. There are zombies everywhere. We have to crawl into the barn and enter a dark maze. Inside, are those noises runners or zombies? Something jumps out growling somewhere and the screams are deafening. We come out into the light and run past life eating zombie to escape. We are outside! But something is blocking the way ahead. It's a school bus. We have to go through it and the Sheriff zombies to get back onto the path. Is there something between the seats? IS THERE? We turn a corner then there's a short uphill with 2 hunter zombies on it before entering the final arena. Those of us with lives remaining (not me) discuss strategy then we sprint off. Some zombies are chained to posts. We twist and turn in the dirt then run through a pit of mud while a guy hoses us down. It is extremely hot and this is nice. We're all soaking wet anyway from the blood pit. 8 infected, 2 survivors (including Kev). Go Fast Food! 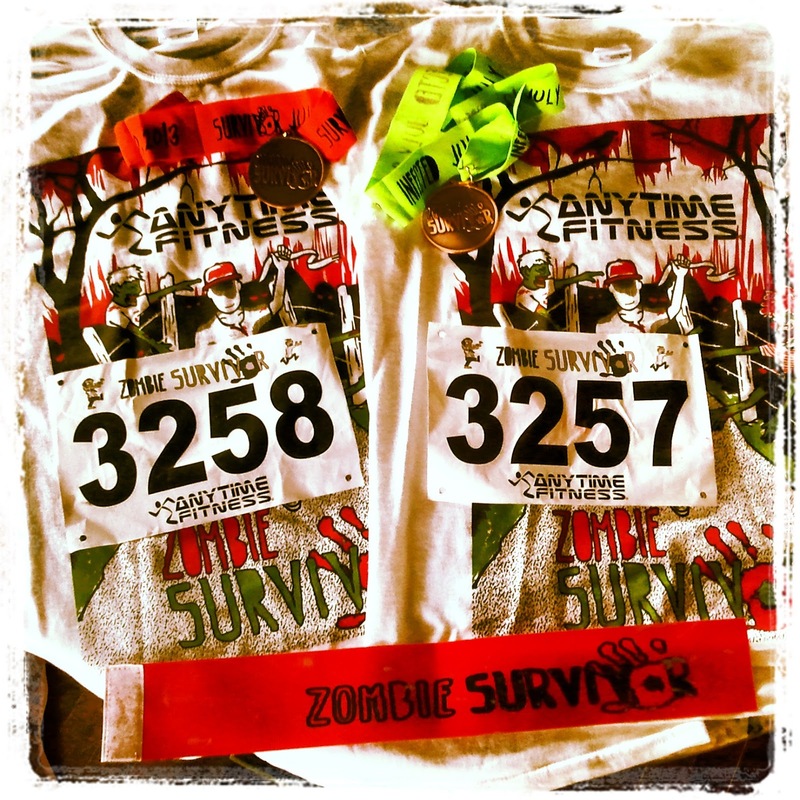 Those of us who became infected got a green ribbon on our medal, the survivors a red one. We also got T shirts and a beer coupon. There were food trucks there but only one had food left by 3pm. Not great for later runners who prioritized beer before food after finishing (yes we did). The zombies were committed, they made huge efforts to get your lives. I loved that, it shouldn't be easy! The attention to detail was great, chip timing, bibs, water stations, life belts, T-shirts, medals, ribbon colours. Great value for money. The zombie makeup and outfits were amazing. I've seen movies that didn't make this much effort. CAN WE DO THIS AGAIN? RIGHT NOW? CAN WE? This looks like SO much fun! I'm in a band that played the post-race party for a zombie race and I was SUPER impressed with some of the costumes and make-up people came up with. Would love to do one of these some day. This is the fun part of being a runner for sure!